Single-use plastic water bottles accounted for 37,000 bottles sold onsite in 2016. These disposable polluters now join a host of other plastic items the Aquarium has removed, including plastic straws, cup lids and cutlery. Diners at the Aquarium have long had peace of mind knowing they are using compostable plateware and cutlery, and can now stay hydrated in a more eco-friendly way. 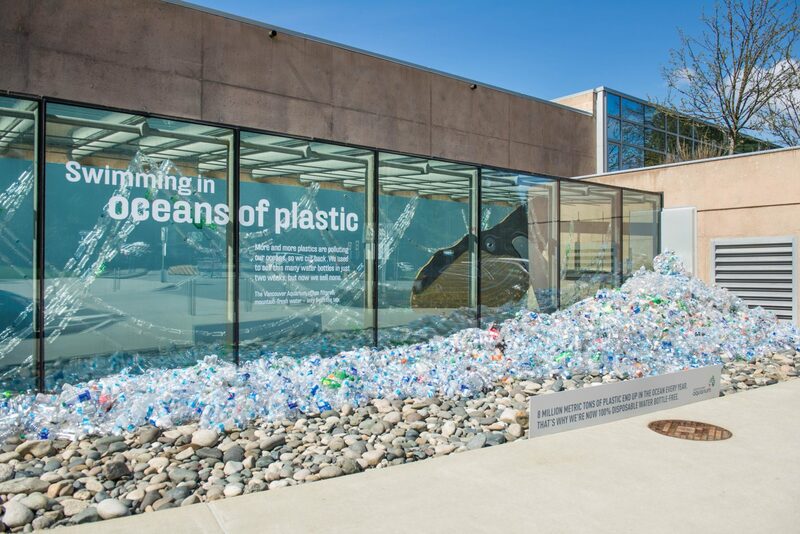 Vancouver Aquarium has taken this latest step to eradicate single-use plastic water bottles to further reduce its ocean plastic footprint and raise awareness about the long-lasting harm caused by these ubiquitous plastic items. With this new policy, visitors to the Aquarium are encouraged to bring their own reusable water bottles. Four new state-of-the-art water fountains and bottle fill stations have been installed in the Aquarium’s galleries and will soon be outfitted with counting capabilities to track the number of bottles that are being saved by visitors using refill stations. An additional outdoor water fountain will be installed for Stanley Park and Aquarium visitors through a partnership with the City of Vancouver. In order to draw attention to the issue of marine life ingesting plastic, a creative, new art installation is now on display in the Ocean Wise Art Atrium. Outside, a giant wave made of water bottles represents the approximate number that were sold in the Café from September – November of last year. Inside, a 20-foot model of a humpback whale hangs in the atrium, among waves made of about 1,200 empty single-use plastic water bottles which represents the average amount of bottles that are being eliminated from the Aquarium’s waste stream in a two-week period. From April 12 – 17, 2017, the Aquarium is inviting people to guess the number of plastic bottles that are in the outdoor plastic wave. The winner will receive a behind-the-scenes tour for four, and a set of stainless steel, reusable water bottles. 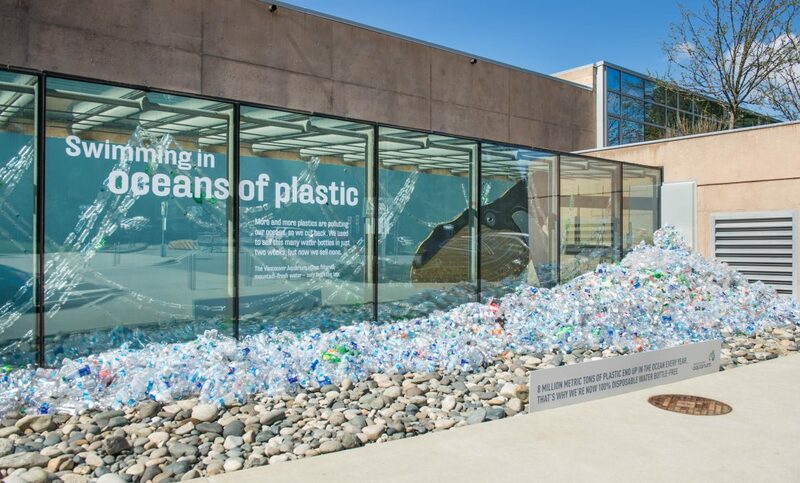 The installation serves to educate guests and Stanley Park visitors about the global impact of plastics. Since 1950, world plastic production has risen from about 1.9 metric tons to 330 million metric tons in 2013. About 8 million metric tons of this plastic end up in the oceans every year, with up to 80 per cent of it coming from land-based sources, such as landfills. Vulnerable sea life, including whales, sea turtles and sea birds, easily mistake plastic items for food and ingest them. The plastic can result in blockages in the animals’ digestive systems and can result in injury and death. Plastics, including single-use water bottles, do not fully break down, and instead break up into smaller fragments called microplastics. Microplastics are an area of focus for the Aquarium’s Ocean Pollution Research Program, headed by Dr. Peter Ross. Dr. Ross discovered that microplastics are being ingested by zooplankton, at the very bottom of the food chain, and making their way into larger animals, such as salmon and, eventually, their predators including whales. One of his studies found that , based off the amounts of microplastics in zooplankton, a humpback whale feeding on these microscopic creatures could ingest up to 300,000 microplastic particles per day. The BYOB policy is part of the Vancouver Aquarium’s ongoing sustainability efforts. Since 2009, Vancouver Aquarium has operated an ISO14001 certified Environmental Management System (EMS).The EMS ensures the Aquarium manages its environmental program in a comprehensive, systematic, planned and documented manner. Two areas of the facility, the entrance complex and the Aquaquest building, have also received LEED Gold certification and Vancouver Aquarium was the first zoo or aquarium globally to receive this certification. The Aquarium was also recently named a member of the National Zero Waste Council, a leadership initiative that brings together Canada’s five largest metropolitan regions with like-minded organizations, businesses, non-profits and government to raise awareness and address change for waste generation. The onsite recycling program includes traditional recyclables, as well as more unique items like foil-lined packaging, thin plastic, electronics, and batteries. Food Service operations use 100 per cent compostable packaging and serving ware, and have eliminated straws, cup lids, single-use tea packets in an effort to be zero waste to landfill.